IPHONE FOR HONG KONG: 23 Dec iPhone4S 訂單，Cut剩幾多部? Apple staff 話經card centre check到我D order 係同一人, 所以CUT淨2部, 慘! "Apple staff 話經card centre check到我D order 係同一人" ....seeems so serious wor !!!! 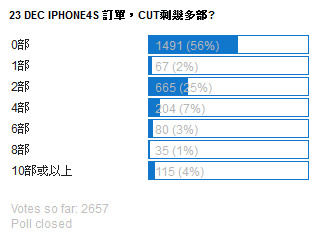 打去吵, 一個人吵十分鐘..10毎人100...100個人1000...看Apple 還cut 不cut 單..